“Take the Hindu religion or take the Hindu social system and examine it from the point of social utility and social justice. It is said that religion is good when it is fresh from the mint. But the Hindu religion has been a bad coin to start with. The Hindu ideal of society as prescribed by the Hindu religion has acted as the most demoralizing and degrading influence on Hindu Society….. It propounds that the superman and his class alone are born to live and rule. Others are born to serve them and to nothing more”. (Dr.Babasaheb Ambedkar Writings and Speeches, Vol-I, pages 218-219). The clash between Christians and Muslims led to crusades during the middle ages. Many lost their lives in the name of religion. This is the starting point of religious fundamentalism in the world. But the Renaissance of the 14th century brought about a new approach to the societal problems and reduced the madness of religiosity. Renaissance movement paved way for the development of science and scientific temper in the European continent. Copernicus, a multi-dimensional personality had contributed a lot for physical science and social sciences. His contribution had established the Heliocentrism which is the basis for the astronomical model in which the earth and planets revolve around the Sun as the centre of the Solar System. Historically, Heliocentrism was opposed to geocentrism, which placed the earth at the centre. This innovative theory had questioned the Christian belief of geocentrism, and shattered the view that god is responsible for the creation of the earth. Many scientists including the Heads of ISRO visit Tirupathi before launching satellite from Shriharikotta. Only a few scientists in India believe in science and scientific temper. Among them, one was the notable Nobel Laureate late Dr. S. Chandrasekar. He had insisted that Atheism is the best way to attain peace and happiness in life. “Was there then some sort of faith a simple system of beliefs that transcend rational thinking and scientific approach that is necessary to acquire a sense of fulfillment and contentment?” Chandra’s response was in the negative. He said emphatically: “No, I don’t have the faith. I am an atheist…. I have persevered in science for five decades and more, devoting minuscule amount of attention to other endeavours… I don’t have any fear or foreboding of death. If someone were to tell me I have cancer and will die in three months, I don’t think it would make much difference to me.” Dr. S.Chandrasekar had handed over a sealed letter to his friend Robert Wald and asked him to open the letter after his death. When the letter was opened after his death, his American friend Robert Wald was astonished to see the highest order of atheism in his last letter. His message was “no rituals”, “no memorials” after his death. That was the everlasting message to people and nations at large by an eminent scientist. .
Dr.Amartya Sen praised Akbar in his book. “Akbar wanted to establish a path of reason (rahi aql) what we popularly know as Din-I Ilahi”. Akbar insisted in the 1590s on the need for open dialogue and free choice, and also arranged recurrent discussions involving not only mainstream Muslim and Hindu thinkers, but also Christians, Jews, Parsees, Jains, and even Atheists”. What we discuss about secularism today was analysed by Akbar in the name of path of reason. Dr.Amartya Sen also mentioned the “followers of Carvaka – a school of atheist thinking that had robustly flourished in India for more than two thousand years from around the sixth century B.C. He has further stated that “Indian traditions are often taken to be intimately associated with religion, and indeed in many ways they are, and yet Sanskrit and Pali have larger atheistic and agnostic literature than any other classical language : Greek or Roman or Hebrew or Arabic. When doctrinal anthology such as 14th century Sanskrit book Sarva darshana Samgraha (literally translated as “collection of all philosophies”) presents 16 chapters sympathetic to 16 different positions on religious issues (beginning with atheism), the aim is to cater to informed and discerning choice, rather than to indicate incomprehension of each other’s positions (p.35). In my opinion, Dr.Amartya Sen could have read ancient Tamil literature and its universal legacy. Every place is my native; every person is my relative in its essence. This ancient Tamil heritage was sabotaged by Brahminism from 9th Century A.D. However, the great social revolutionary Periyar E.V.Ramasamy had fought against religion, god, blind beliefs, age old practices and wrote articles, delivered speeches covering 75 years of 20th century. We have thousands of pages of books, articles by different eminent thinkers and writers on atheism. 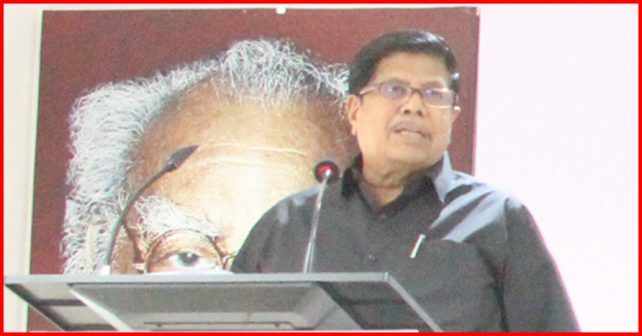 Had he been properly informed the great contributions of Dravidian movement led by Periyar EVR, Anna, Kalaignar, Navalar, Perasiriyar and Asiriyar Veeramani, he would have mentioned Tamil as one of the classical languages where he could see enriched materialistic and atheistic ideals and ideas.